No 7 Military Drive at Military Drive in Portpatrick, near Stranraer, Dumfries and Galloway sleeps 10 people. Military Drive near Stranraer has a wonderful setting with views over the picturesque town centre, harbour and out to open sea; these spacious, detached houses offer an ideal base from which to explore the surrounding area. 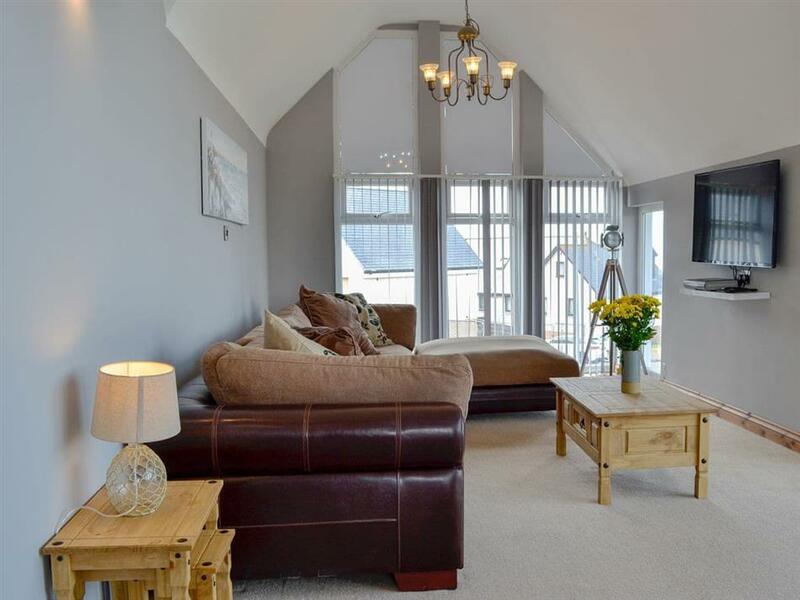 No 4 (ref UK5569 [4 Military Drive]) has stunning views over the sea from most windows, and also from the hot tub. 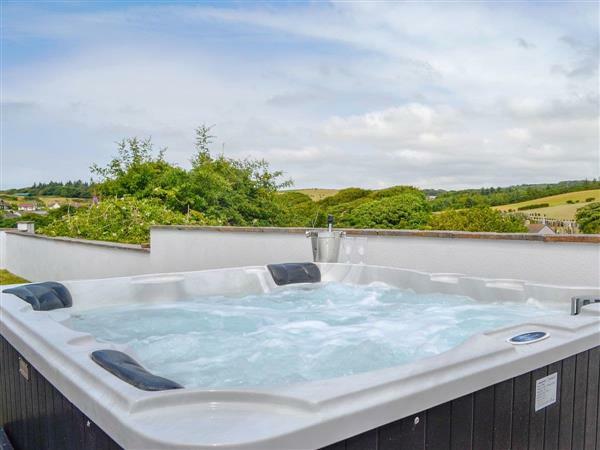 No 7 (ref UK5736) is situated next door to No 8 (ref UK5770) and has a spacious interior with hot tub to the rear, while No 8 also with a hot tub, has a first floor living room with pool table, bar and French doors leading out to the balcony. From the challenging uplands of the Galloway Hills to gentle seaside trails, rolling moors and dramatic cliff-top walks, the Southern Upland Way passing close by presents the ideal focus from which to enjoy the many and varied shorter walks within the region. The dramatic scenery is home to a rich company of flora and fauna, with many unusual species including pine martens, golden eagle, ospreys, red deer, red squirrels and the natterjack toad. The area has many renowned gardens to visit including the Botanic Gardens in Port Logan. Wigtown, Scotlands official book town is also home to a charming gallery, excellent cafés and is located only a few miles from Bladnoch Distillery, where visitors can sample the local malt whisky. For fishermen, the area offers a wide variety of opportunities including sea fishing from Portpatrick and both trout and salmon fishing close by. Other country pursuits are available including shooting and riding. Golfers will feel equally at home in this area with Stranraer, Portpatick and Lagganmore golf courses within a 20-minute drive. Turnberry, with its world famous course, is only 45 minutes away and also offers a spa, off road driving, quad biking activities and restaurant facilities. For the active there are numerous cycle routes set out in stunning Forestry Commission surroundings and cycle hire is available at these centres. Sailing is available via the local marina, and for those happy to travel slightly further afield, there is the Galloway Sailing Centre where visitors can also try windsurfing, canoeing and power boating. From Stranraer, 15 miles, there is the ferry service to Ireland for a day trip. The beach is 200 yards from Military Drive near Stranraer. With the shop, pub and restaurant 200 yards from Military Drive. 7 Military Drive (ref UK5536 [Minnow Cottage]) can be booked together with 4 Military Drive (ref UK5569 [4 Military Drive]) and 8 Military Drive (ref UK5570 [8 Military Drive]) to sleep up to 32 people. Kitchen/dining room: With electric oven, electric hob, microwave, fridge/freezer, dishwasher, washing machine and patio door leading to decking. Living room: With 50 Sky Smart TV and French doors leading to balcony. Bedroom 4: With zip and link super king-size bed (can be twin beds on request). Bedroom 5: With zip and link super king-size bed (can be twin beds on request). Electric central heating, electricity, bed linen, towels and Wi-Fi included. Travel cot and highchair available on request. Welcome pack. Enclosed lawned garden with sitting-out area and garden furniture. Balcony. Hot tub for 6 (private). Bike store. Private parking for 2 cars; additional on road parking. No smoking. Holidays at No 7 Military Drive, Military Drive run from Friday to Friday. Pets allowed at Military Drive - No 7 Military Drive. For a better idea of where Military Drive - No 7 Military Drive is, you can see Military Drive - No 7 Military Drive on the map below. Military Drive - No 7 Military Drive is in Wigtownshire; should you be on the lookout for a special offer, you can find all the special offers in Wigtownshire. It's always worth checking to see what is on offer at the moment. Do you want to holiday near Military Drive - No 7 Military Drive (UK5736), you can see other cottages within 25 miles of Military Drive - No 7 Military Drive; have a look to find your perfect holiday location.